We've had a busy year! Before we get started, our Thanksgiving sale is on right now! We’ve bundled all of our ‘Pro’ software together into one incredible, jam packed behemoth of awesome! From 20th November through until 4th December you can get the Pro Bundle at a 33% discount. That’s right, we’ve cut 1/3 off the price and saved you over $250! Don’t believe us? Click below and enjoy Pro software at an incredibly low price. Around 12 months ago, we changed the way we do things at FXhome. We were getting increasingly impatient and antsy whilst waiting to put out new features that you’d requested and would love to get your hands on – but we were tied to our yearly release schedule. The more we thought about it, the less sense it made. 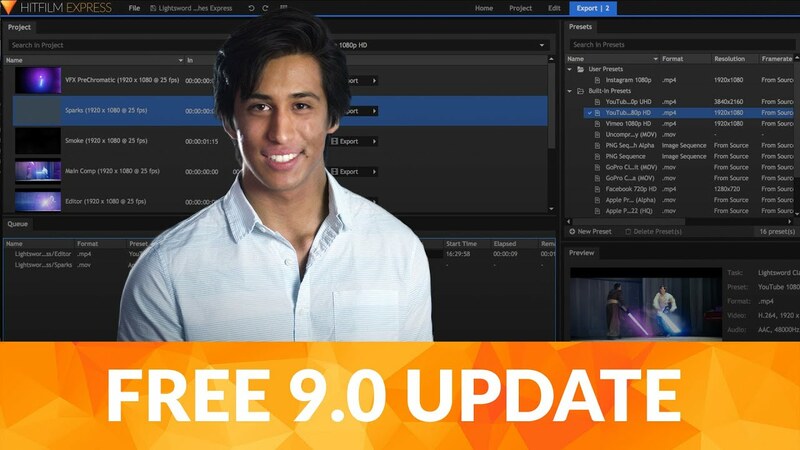 So in November 2017, we ripped up the old rules and changed our pricing model so that those who buy HitFilm Pro (or Ignite, or Action), get 12 months of free updates and support included. Since then, we’ve been working around the clock to listen to you all, and improve the software month on month. The current version that we have is truly a lovingly crafted, user-created beast. As Thanksgiving hits everyone starts cracking out their big woolly jumpers and cranking up the heating. No? Just us? Still, we wanted to take a brief moment to sit back, relax with a cup of tea, and look back over the past 12 months and see just how much your ideas and feedback have changed and improved the HitFilm experience. Recreating realistic motion graphics became reality with the introduction of new Behavior effects. Want a cluster of comets destroying a city? Or objects orbiting around a planet? Not a problem! Simple physics equations under the hood allow your magnificent meteors and majestic moons to move far more practically than ever before. We also enabled you to use 3D geometry effects such as extrude, bevel and rotate with your text to create the look you want. To top it off, this additional geometry supports lights, shadows and environmental maps, so you can further enhance your title sequence to perfectly accompany all of your other HitFilm creations. New fonts! Spacing and text box improvements! Language support! 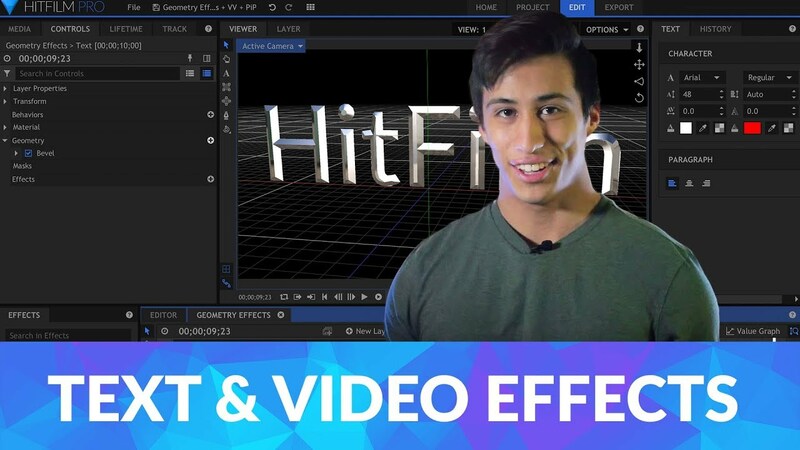 In the last 12 months we’ve fundamentally changed how you work with text in HitFilm, so now you can spend less time wrestling with your titles, and more time perfecting the final edit! There’s nothing worse than being immersed in a project, only for the entire programme to chug and struggle when you need it most. We’ve worked hard to keep HitFilm running as fast as you work – improving performance by up to 10 times in some places! The Flash, eat your heart out! In what was a big step forward for productivity this year, we’ve been working extensively on how exporting affects your overall HitFilm experience. The main addition being the new export queue, meaning you can continue working whilst HitFilm gets cracking on exporting, letting you ‘set it and forget it’. Adding and adjusting effects became a heck of a lot easier and more intuitive this year with the addition of graphical widget controls for over 40 of our HitFilm Pro effects! Mess around with the effect’s properties to your heart’s content directly in the Viewer, saving you valuable time and a whole heap of frustration. The layout panel was one of our big updates this year, significantly streamlining alignment and positioning tasks, whilst giving you enhanced tools to precisely position and align layers. Who doesn’t love layer enhancements?! 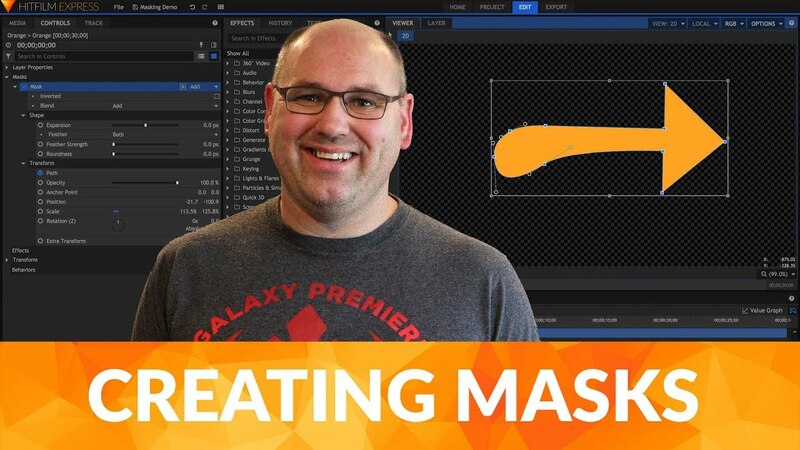 Masking tools were beefed up considerably as well this year, really allowing you to dive in and fine tune the positioning of your masks and spend less time mucking about with anchoring and scaling! What’s that you say? Those updates are fantastic, but you were hoping for some additional plugins? Well then, SURPRISE! We’ve only gone and released additional plugins to give you even more choice in the edit! With Inner and Outer Glow, utilize faux drop shadows, or add bloom and halo effects. Want to give everything a wet or slimy texture? Gross, but go for it! Exposure will allow you to truly perfect any shots that require in depth adjustment, whether it’s playing with the contrast or tweaking the vibrancy of individual images, we’ve got you covered. And finally, if a hazy sky or fog has ruined a perfect shot, the Dehaze plugin will allow you to clear things up in a jiffy. All of this, alongside the huge number of tweaks, enhancements and bug fixes, is down to you. All of you. Your feedback and requests help mold each and every update we release, so thank you for your continuing support and dedication. With your help, we can make sure that everyone has accessible software that can keep pace with anything your imaginations come up with! If you’d like to see the full list of updates, enhancements and fixes, click here. HitFilm 11.0 Update FXhome pick up 2 trophies at Norfolk Business Awards!